Over nearly 40 years I have run hundreds of British Canoe courses across all levels, in both coaching and personal performance but one of my favourites is the SUP Module. This Discipline Specific Module was introduced several years ago in response to the significant increase in the number of people taking up Stand Up Paddleboarding. 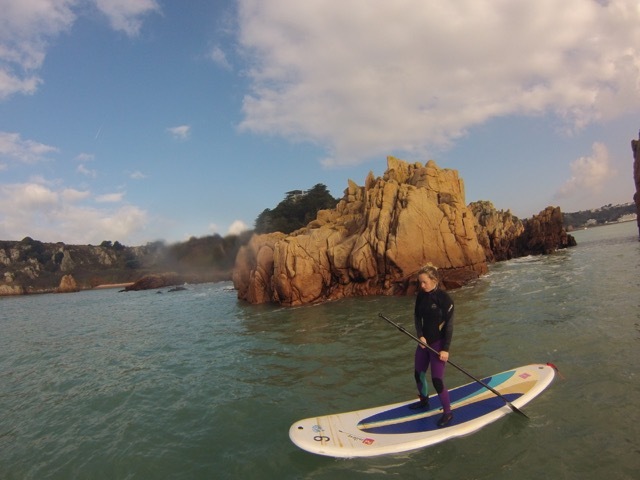 Over the last couple of years I have run quite a few of the courses, attracting paddlers from both on and off Jersey. What is interesting, is that as each course follows another, the level of the participants has steadily increased. As a result last weeks course was just a pleasure to run. With all the paddlers showing competency on the boards. Conditions couldn’t have been better for the SUP Module. I remember completing my training course in Nottingham, wearing a dry suit and being absolutely frozen, trying to avoid going into the water too many times. This week it was warm, clear seas and light winds with every opportunity was taken to get into the water to cool off. In the past it has been all to easy to be critical of British Canoeing courses but I think in this instance they have just about got it right. That day with the staff from Absolute Adventures, we had a really positive experience. Tico might be the first dog to complete the SUP module. He has previously found fame in national papers as a surfing dog. Heading across Beauport Bay in perfect conditions. It was an ideal day for paddling a few hundred metres, stop off to practice a few skills and then carry on with the journey. We even had the opportunity to paddle through some narrow channels, which are normally too rough to consider going through, when working with groups. No course in Jersey would be complete without the opportunity to leap off the cliffs. 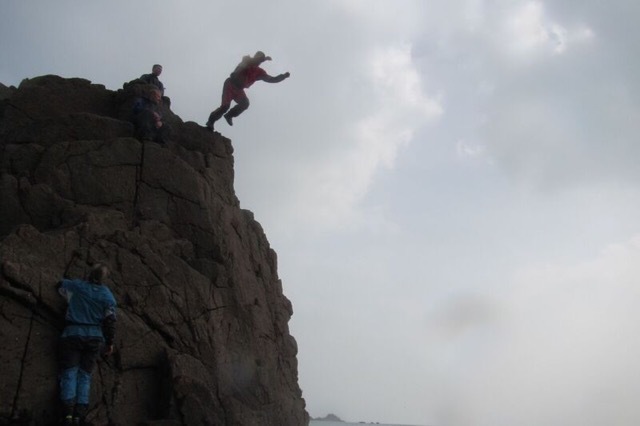 Jumping off rocks is in the DNA of people who live in Jersey. Heading back in we were able to join together in one long raft, which we managed to hold together for at least 400 metres. It was inevitable that we were going to finish the days with a few games. British Canoeing have developed a discipline support module for those coaches who want to be involved with Stand up Paddleboarding and, in my opinion, it is one of the most sensible developments of the last few years. 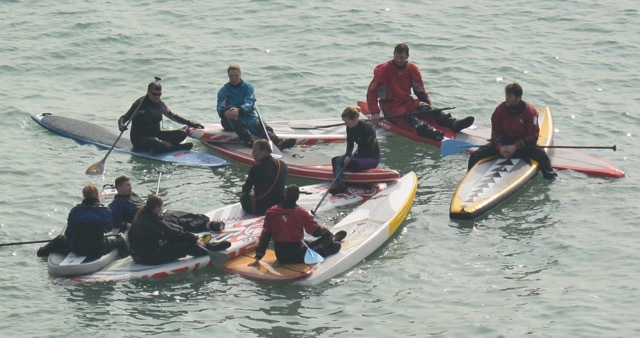 Allowing existing paddle sport coaches who have experience of SUP, to train so that they can deliver SUP sessions in sheltered waters to groups who are keen to receive some coaching in this rapidly expanding discipline. Last weekend Tower Hamlets Canoe Club paid a visit to the Island and took advantage of the opportunity to take part in course. 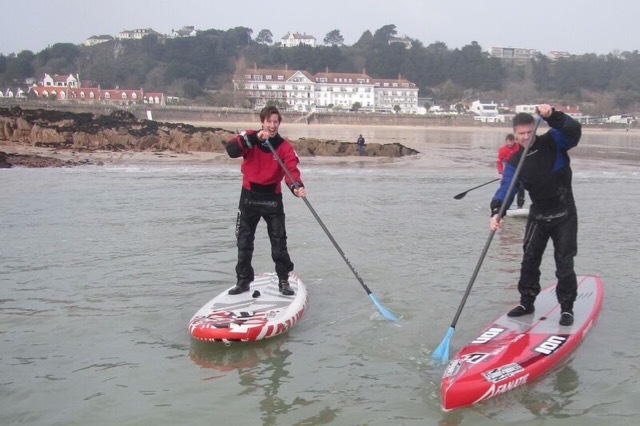 St Brelade’s Bay was the venue but because of the pleasant conditions we were able to include a short trip around to Beauport, taking the opportunity to swap boards and paddles, ensuring that everybody was able to try a variety of equipment. So if you are involved in paddlesport coaching and are looking for some professional development and the opportunity to expand your coaching remit then look at getting on one of the British Canoeing SUP courses which are running over the next few months. It wouldn’t be a course in Jersey unless there was a bit of cliff jumping. 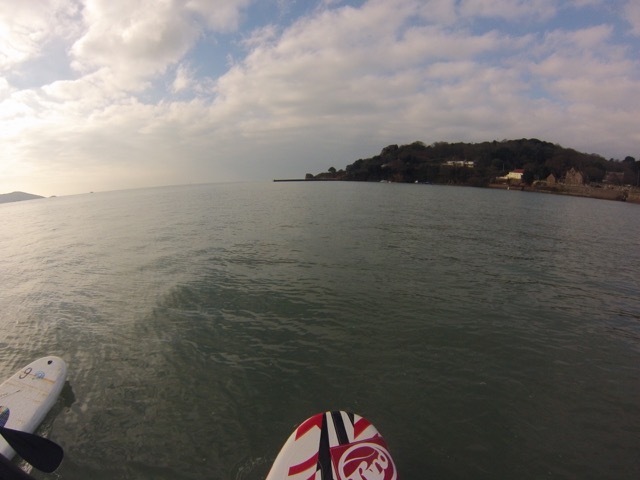 It is amazing how a sunny morning with light winds will encourage you to get out on the stand up paddleboards. That is just what happened on Friday morning. It was hard to believe that less than 48 hours ago the Island was being battered by a significant storm. Heading out on the early morning spring tide. 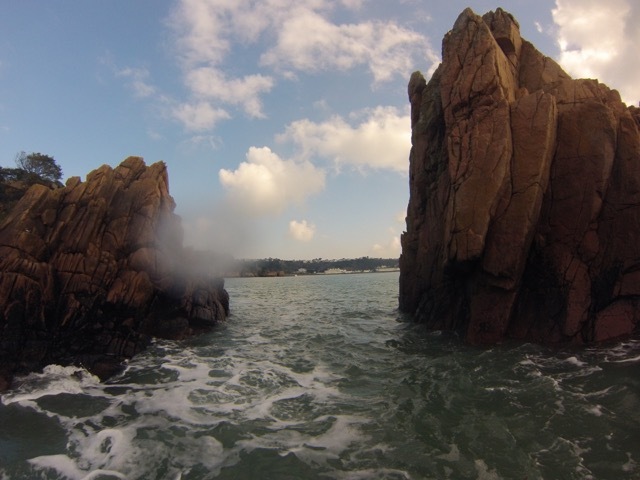 With the high spring tide we were able to enter one of the small caves in St Brelade’s Bay. 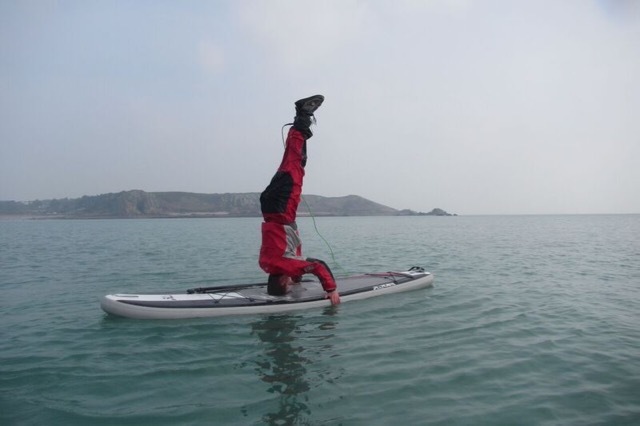 One of the great things about paddle sports is the opportunity to do new things. 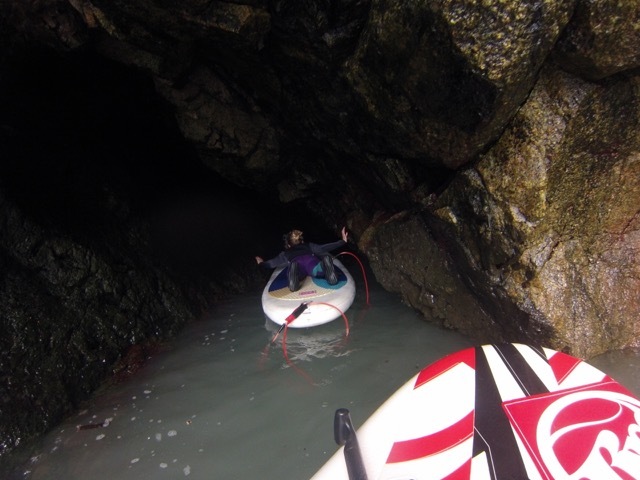 I first paddled in St Brelade’s in 1969 and up until today I had never paddled into this cave. 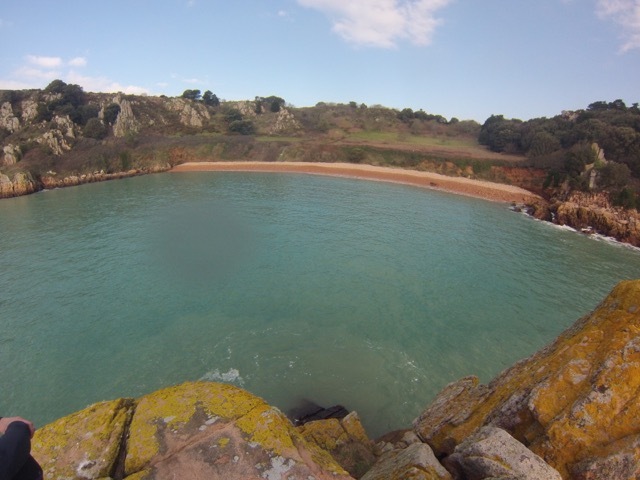 Beauport is possibly my favourite bay on the Island and today it looked particularly special when viewed from the stack in the middle of the bay. Heading through the gap, back into St Brelade’s and time to refresh some skills such as rescues and towing. Despite the broken arm, from yesterday, I was able to head to the Minquiers today courtesy of Jersey Seafaris and their RIB. Located just over 12 nm of St Helier the passage south was pretty quick, at times we reached just over 40 knots. The Minquiers are a simply stunning destination, which I love to visit but all of my previous visits have been by sea kayak, so it tends to be a two day activity whereas today it was all completed in a couple of hours. Chester and myself were dropped off by the boat on the northern side of the sand bar. With the open water to the north and the more sheltered water of the lagoon to the left. What a fantastic day for March. The first thing was to blow up the boards. They were just so easy to transport on the RIB. The sheltered waters were an ideal learning environment and the weather couldn’t have been more suitable. The main island with the houses on is just in front of the paddlers. Today we were not going to visit Maitresse Isle, we wanted to take advantage of the conditions in the lagoon. It was hard to believe that it is March. As we ate lunch we were probably the most southerly people in the British Isles, we were just south of 49 degrees north. A great place to spend a couple of hours but all to soon it was time to head back north to the bright lights of St Helier.